Choose from Both In Stock and Quick Ship Flexible Casings for Fast Shipping. 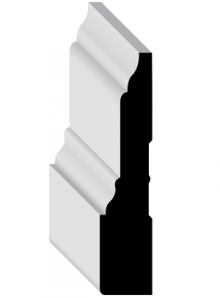 Unlike carved rigid mouldings, our flexible arched mouldings, made from polyurethane resin, are flexible enough that you don’t have to order the exact size for perfect results. Full circle, half circle, and symmetrical arches can flex and be adjusted to fit your opening, eliminating the need to make a template. Elliptical and oval arches require templates to make the flexible mouldings fit properly. Download our easy to use arched templates. Duraflex is moisture and insect proof polyurethane resin material that will withstand extreme heat and cold temperatures without warping, cracking, or deteriorating. 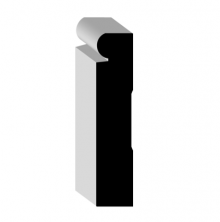 Our flexible mouldings can be used for interior and exterior applications. They can be finished with paint, or stain like any type of wood. All the casings listed below on this page are usually in stock and ready for quick shipping any where in North America. 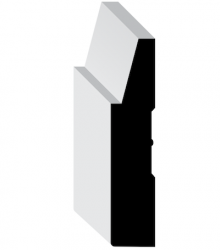 For other custom casing and custom sized arches, you can choose from the hundreds of profiles listed in one of our catalogues click here. 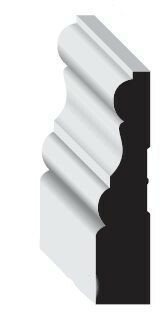 If you are trying to match an existing rigid profile, you can send an email to sales@elitetrimworks.com with the size and picture and we will be able to determine if it can be produced, or whether it will need to be tooled to replicate. The quick ship casings will ship within 2-3 days of ordering. For custom orders, please allow 2-3 weeks for production and inbound shipping. The installation and painting/staining tips for our flexible casings can be found here. Flexible Colonial Casing 3 1/2"
Flexible Step Casing 3 1/2"
Flexible Shaker Casing 3 1/2"
Flexible Victorian Casing 3 1/2"